The Anoka-Hennepin Parent Involvement program is excited to offer free resources for parent-teacher organizations (PTO), booster clubs, advisory councils, and other non-profit organization members through a special event, the "One Stop Workshop," Sat., Feb. 23 from 8:30 a.m. to 1 p.m. at the Educational Service Center (2727 N. Ferry Street, Anoka, MN 55303). The One Stop Workshop helps members of parent-teacher organizations, booster clubs, advisory councils and nonprofit organizations learn how to strengthen their efforts to support groups and organizations, and hear valuable information from experts in the field. 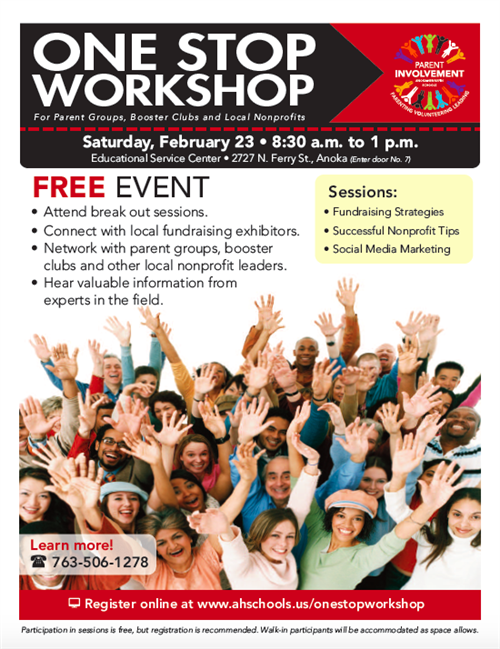 This FREE event offers participants the opportunity to connect with local fundraising partners/exhibitors, network with other parent groups, boosters, and community leaders, and listen and learn about popular topics related to the work. Sat., Feb. 23 from 8:30 a.m. - 1 p.m. Participation in the event is free, but registration is recommended. Walk-in participants will be accommodated as space allows. Learn more by calling the Parent Involvement program at 763-506-1278, or visit www.ahschools.us/onestopworkshop to register online.